Paw Print Genetics - What’s in a Name? "What's in a name? That which we call a rose by any other name would smell as sweet." That famous quote by William Shakespeare conjures up images that any name will do. But will it? 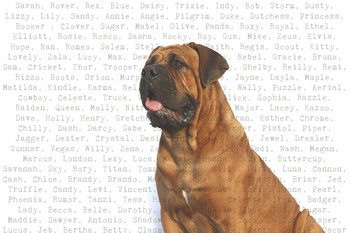 How do you choose names for your dogs? In our household, we all participate in thinking up names for our new dogs. However, when it comes to decision time, my husband or myself usually make the final determination. Otherwise, we would have more than just a pygmy goat named Princess Ariel Diamond! At Paw Print Genetics, our online account management system allows you to put all of your dogs into your account, keeping your information and genetic testing results all in one place. We see some fantastic and imaginative names come through our laboratory. We thought it would be fun to see what names are most commonly used. Some other very common names are Storm, Stella, Molly, Rosie, Buddy and Daisy. What about certain breeds? Are some names more common among particular breeds? The most popular names for a golden retriever are Luna or Willow. For miniature American shepherds, the most popular names are Buddy, Lacey and Skye. The most popular name for a Border collie is Roy or Gus. Miniature Australian shepherds are Buddy, Penny and Bella, but Paisley and Roxy are popular too. For standard poodles, Charlie is the most common name. I was surprised to see that for many breeds, such as the Chinese crested, collie and rat terrier, we have only a couple of names used twice and the rest are all unique! From my childhood, I thought that we would have more Rovers, Spots and Blues, but we have had only 5 dogs named Rover, 3 named Spot and 4 named Blue. But we have had a Mr. Miyagi, a Mr. Spock and one Thomas Jefferson! Our most recent dog added to our family is Daisy Jane, named after the song sung by the band, America. It was either that or Maggie May. Hmmm, makes me wonder how others decide on names.